(…continued) There are other similar verses. In John chapter 14 Jesus says, “I am the way and the truth and the life. No one comes to the Father but by me.” In Acts 4:12 Peter says of Jesus, “Salvation is found no where else, for there is no other name under heaven given to men by which we must be saved.” And in John 10 Jesus condemns those thieves and robbers who try to get into his fold by any other way than through him. Jesus is the door, the way to God. Someone might say, “Who do you Christians think you are? Are the only ones who know anything God?” Our response would have to be, “I think I am what the Bible says I am– a lost sinner, one who is alone and without hope, except that Jesus died for me and says that I can belong to him.” Is that arrogant to believe that we are sinners, lost and without a leg to stand on before God, and unable to come to God on our own? When as Christians we tell people about Jesus, we are not saying that we are smart and good, and that everyone else is dumb and wicked. The message is that we and everyone else are all alike in the most important way; we are all sinners standing in need of God’s freely given grace, offered to us all in Christ Jesus. 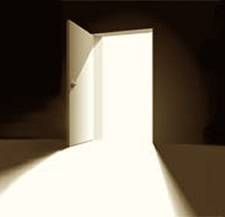 And the door is wide open to everyone. Someone might say, “Why do I need Jesus? I’ll be okay in the afterlife, I’ll get in without Jesus?” But then the question is, “Get in where?” Who else, besides Jesus, has offered such a gift of eternal life, and then backed up the promise with his own resurrection from the dead? What other door is there? Who else has demonstrated such power over death? And if such power over death is to be found only in Jesus, we should be happy to accept His invitation. Martin Luther said that to tell another person about Jesus is not an act of superiority or arrogance, but of humble love and concern, like one beggar telling another beggar where to find food. Acts 4:12 — Salvation is found in no one else, for there is no other name under heaven given to mankind by which we must be saved.